RainChute EZ® is an above-ground downspout extension that installs easily to direct water away from your foundation. RainChute EZ® is best used in a landscaped area. RainChute® is a recessed downspout extension that sits flush with the ground. It's best where the lawn goes up to the foundation since lawn mower traffic won't hurt it. Both the RainChute EZ® and RainChute® self flush leaves and debris away. LawnScape™ is a pipe buried from the downspout to a special LawnScape™ outlet that lets the water out onto the surface while camouflaging the end of the pipe. The lid comes off for easy cleaning. LawnScape™ is best used for downspout extensions over 8' long. Installing RainChute® and RainChute EZ® is fast and easy, and should be complete within 15-30 minutes. Installation of LawnScape™ takes less than an hour. Any combination of these three options will help keep roof water away from your foundation. Why Extend Your Gutter Downspouts? When your gutters discharge water next to your foundation, much of it can seep directly into the soil around your home. This can significantly add to basement leaking, and it can even contribute to foundation issues. By installing any combination of our downspout extensions on your gutters, this problem can be averted. A simple extension added to your downspout is a great way to make sure that roof water is kept far away from your home. Our RainChute® and RainChute EZ® provide simple, cost-effective solutions to this problem, with a design that will never clog! To add the greatest beauty and appeal to your landscaping, consider installing our LawnScape™ Outlet as an underground extension to your downspouts. Its green color blends in with your lawn and lawn mower traffic won't hurt it. A buried pipe directs water away from your home and onto the surface through the special LawnScape™ outlet. The lid comes off easy for cleaning. All of our gutter and downspout products are a great compliment to your existing basement waterproofing system! 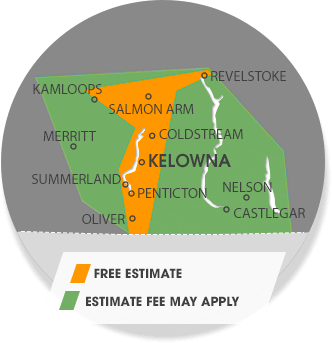 We service Vernon, Kamloops, Kelowna, Nelson, Quesnel, Penticton, West Kelowna, Salmon Arm, Castlegar, Williams Lake, Winfield, Westbank, Coldstream, Trail, Oyama, Chase, Armstrong and many nearby areas in British Columbia.